Brush the inside of the focaccia with olive oil, so that a thin layer is coating the inside of the bread. Sprinkle the sun dried tomatoes on top of the bread. Place the cheese on top of the tomatoes. Top the cheese with the artichokes, peppers, and olives. 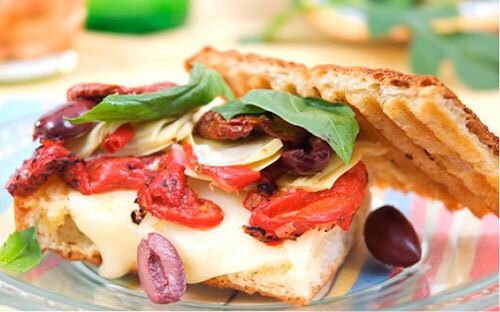 Place 4-5 leaves of fresh basil on top of the vegetables and press the sandwich together. Lightly brush the outside of the bread with additional olive oil. Place in the Panini machine and cook for 5-6 minutes or until the bread is crisp, golden, and the cheese has melted.